Noah is estimated to have lived between 8,000 and 9,000 BC? Could it be that 10,600 – 11,000 years ago, the ninth planet had approached our inner solar system? If so, would a similar pattern of Earth Changes have been repeated? Here is what would probably have happened, given the historic citing of the holy books; the magnetic pull of the ninth planet would have caused the Inner Core of Earth to tilt, and the magnetic field to tilt along. As a result of the pull, Earth magnetic field would have protruded into space, and so it appeared to get weaker, when measured on surface. The tilting of the Inner Core would have been manifested by the magnetic poles wandering away from their original positions. The ice caps formed over thousands of years, would have become unshielded and would have melted in a way similar to what we have started to experience recently. The grand finale would have taken the world by surprise, as the final tilt left the remaining ice unprotected, causing a sudden fragmentation of giant ice blocks to fall into the ocean. The relocation of the magnetic pole would have also brought the speed of the planet to change and accordingly changing sea levels. When the speed became faster, the oceans rose between the Tropics and receded elsewhere. If the change were sudden, the rise of sea level would cause a great flood of epic proportions all across the globe between the Tropics. Holy books spoke of it as well as geological evidence of sudden sinking of Sunda platform in Malaysia some 11,000 years ago. 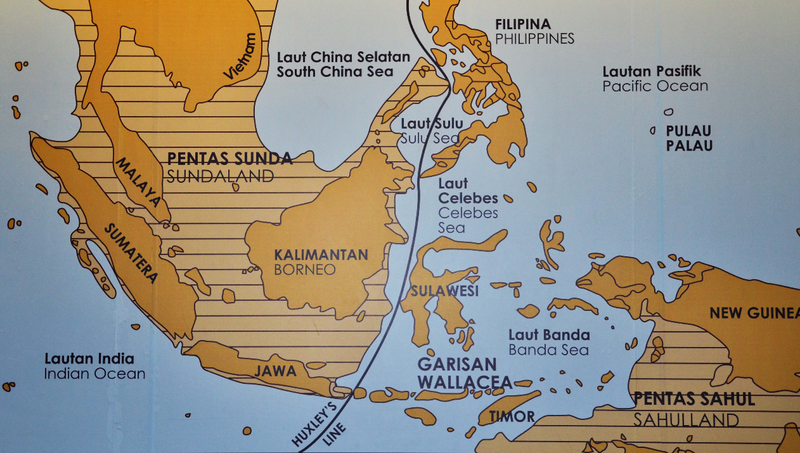 As per the National Museum at Kuala Lumpur, which I visited three times, there scribed the following over the above map: three distinct worldwide sea-level rises (around 14 000, 11 500, and 8000 years ago), due to melting of the ice caps, caused the sinking of Sundaland. Photo taken from the display boards of Gallery A, Muzium Negara. I was always wondering, how come the human maximum life span at the time of Noah was close to a thousand years of age; whereas, it is currently decreased to a hundred years? The answer could be simple when we reflect on The pineal gland that is activated by light, and controls the various bio- rhythms of the body. It works in harmony with the hypothalamus gland, which directs body’s thirst, hunger, sexual desire and the biological clock that determines our aging process. The solar year is fixed by time. If Earth spins slower, and the number of days becomes less, the number of successions of day and night will trigger the pineal gland to slow down the aging process. As explained on Earth Spin Speed page on this site, the changing of the angle between the Outer Core electric currents and the Inner Mantle magnetic field force lines changes the strength of the generated Lorentz Force and accordingly the driving force to get Earth spinning. Earth would still complete a full circle around the Sun in the same time it experiences nowadays, in what we call a solar year. However, the succession of day and night could be less frequent than 365 per solar year. If the succession of day and night, during a year for example, is brought down by 10 fold i.e. to 36 days, the pineal gland aging process will slow down so that the life span, in terms of solar years, will increase in the same proportion i.e. 10 fold. The maximum life span could jump from 90 to 900 years. Could that sequence of events repeat itself, now that we are approaching 3,550 years from the last time the ninth planet paid the inner solar system a visit? Fantastic article which I have shared with many. Thank you for posting this! If the earth was spinning at 1/10 the speed, there would only be 36 days in a year. Do historical accounts support a year with only 36 sunrises and sunsets? And was the lunar cycle only 3 days? The research by the scholars of the Indian Institute of Geomagnetism, Colaba, Mumbai, India in the year 2000 goes to explain that patches of south magnets started to appear in Antarctica some 10,000 years ago. Ever since, the intensity of such patches aka “plasmoids” has increased. Most scientists can not explain that phenomena and answer the question as why regions of south magnetic field appear in Antarctica where the north magnetic pole mostly wanders ? I try to explain on the Earth Magnet page of this site that the core magnet configuration of planet Earth consists of A) one permanent dipole magnet that is pulled by the magnetic field force lines of other magnets/ planets of the solar system and as such it swivels and is observed to tilt by the wandering of its poles on the surface of Earth and B) two induced magnetic fields that are generated by the motion of the free electrons as they flow in the Outer Core. The induced magnetic field can only be produced when Earth spin speed is fast enough to let the Outer Core flowing electrons to move in helical paths and to induce magnetic field force lines following the Faraday law of induction. This tells us that quantum increase in Earth spin speed took place some 10,000 year, which resulted in core electrons to flow in helical paths, inducing magnetic field force lines of south polarity at both Arctic and Antarctic regions; very much on the orthographic projection of the Outer Core. This same change of speed caused the oceans to rise at the equatorial region and to grow lower at the northern and southern hemispheres. As you know Earth is bulged at the equatorial regions due to difference in crust and ocean speed at the axis of rotation (0 km/ hr) versus the crust and ocean speed the equatorial line (today is 1670 km/ hr). High speed oceans try to fly into space but Earth gravitational pull holds them back; resulting in bulged planet. The great flood had then occurred and was described by almost every civilization that inhabited the tropical regions from Central Americas, to Middle East, India and China. I also explain on the Great Deluge page of this site that the Pineal gland which is activated by light, and does control the various bio- rhythms of the body, drives the biological clock that determines the aging process. Human body is designed to survive some 30,000 succession of day and night or “days”. When you divide by 365 day/ year, you can easily deduct that the human body should have an average live between 80 to 90 “solar years”. We understand from ancient texts that Noah and people around him lived to some 900 to 1000 solar years of age. When you divide the average number of day in the life of a human or 30,000 days by the number of solar years people used to live around Noah’s era or 950 you will find that in one solar year the planet Earth had only 32 successions of day and night or days. The planet was spinning much slow then, and if interested to learn of the different spin speed at different times you may be interested to read the Change Cycle page of this site. The day was longer and the lunar cycle was 3 days. Neither the orbital speed of the Moon around Earth nor Earth’ orbital speed around the Sun has changed. The orbital speeds remained constant as they are measured today.